“Hills Like White Elephants” is a very famous example of Hemingway’s gift for implication. 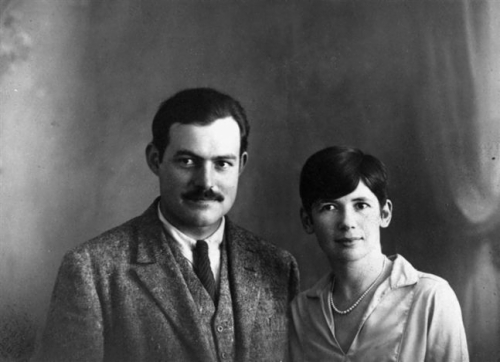 This, you will recall, is the Hemingway story that is about abortion without ever using the word abortion – and that is a magic trick in itself. The symbolism throughout is ripe for interpretation. Not that interesting, though. What I’m most taken with in the story is the conversation between the man and the woman. Like everything else here, Hemingway leaves it skeletal, vague and ready for analysis. The power dynamic is fascinating to analyze. Back and forth the couple dances around the subject – never truly touching on it but never truly avoiding it either. Who is the decision maker here? That’s what I come back to the story trying to sort out. The woman seems deferential one moment; the next she totally undercuts the man’s suggestion. This is the best of Hemingway’s bare-bones, sketch stories, as far as I’m concerned, and the dialogue between the couple at the heart of the story is the best part. And that’s quite a trick on Hemingway’s part.